A most impressive apartment found at the lower ground level of this handsome Grade II listed building and being conveniently located close to Central Cheltenham. This apartment has been refurbished and offers entrance hall, large living room open to kitchen, one double bedroom and a bathroom. There is also recently fitted electric heaters and communal gardens. Directions: Leave Cheltenham via A40 London Road (inner ring road via Berkeley Street); continue straight over the traffic lights (junction Hewlett Road /College Road); No. 54 can be found on the left hand side (right hand corner of Sydenham Villas Road). Entrance Hall: Entrance door, wall mounted heater, laminate flooring, walk in airing cupboard housing hot water cylinder, shelving and fusebox. Fitted kitchen with a range of wall and base units with work surfaces over and matching upstands, stainless steel single drainer sink unit with mixer tap, built-in oven and hob with extractor hood over, integrated ‘fridge/freezer, integrateted washing machine, recessed ceiling spotlights, window to rear, laminate flooring. 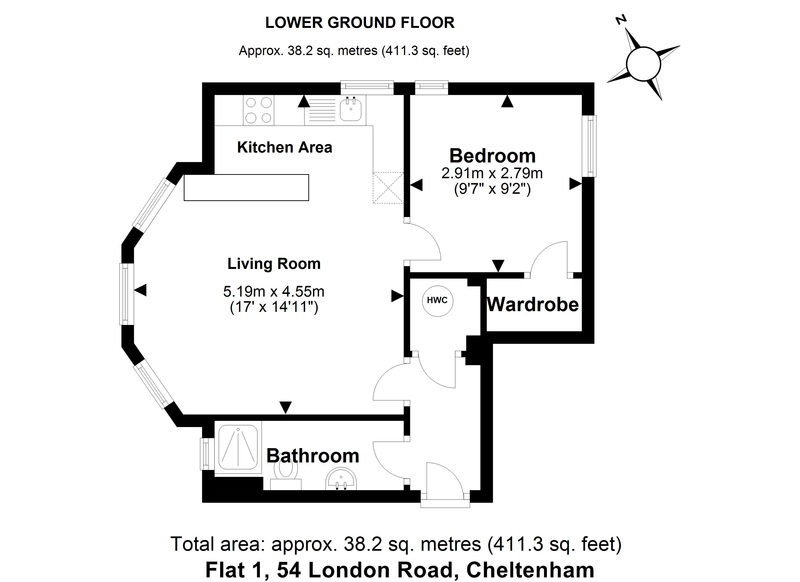 Two windows, wall mounted electric heater, fitted wardrobe/cupboard, laminate flooring. Bathroom: Obscure glazed window to side, low level wc, pedestal wash basin, tiled shower cubicle, recessed ceiling spotlights, wall mounted electric fan heater. Outside: There are communal grounds. Leasehold - a new 999 year lease we are informed. Council Tax: We are informed by Cheltenham Borough Council that the property is in Band ‘B’ with £1,363.66 being payable for 2019/2020.